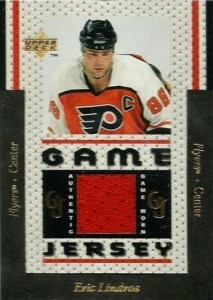 At one point, Eric Lindros cards and memorabilia were the hottest in the sport. Playing for a franchise with a rabid fan base like the Philadelphia Flyers can have that effect on a players collectibles. This is especially true when one plays the game with the hard-hitting style in which Lindros did throughout his career. 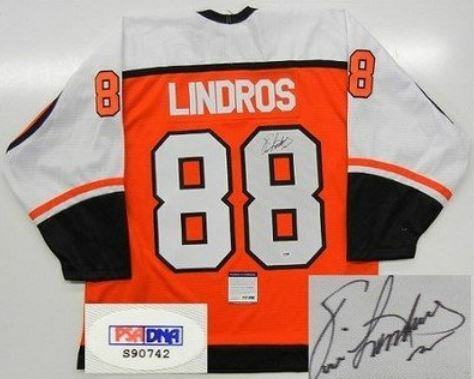 Lindros had to initially overcome being labeled a prima donna after being drafted by the Quebec Nordiques with the first overall pick in the 1991 draft and then refusing to play for them. His career would be forever compared to that of Peter Forsberg, who was a key part of the trade that brought Lindros to Philadelphia. After scoring at a point-per-game pace his rookie year, the City of Brotherly Love quickly adopted Lindros as a franchise favorite. As a highly touted NHL prospect, Lindros had minor league cards issued in 1989-90 and again the following year as part of the Oshawa Generals team set. Theses cards are very popular with collectors, particularly those in Canada. As a result, and somewhat surprisingly, they are often counterfeited. 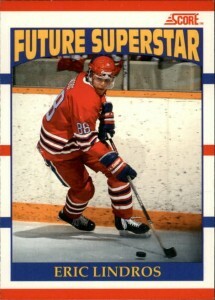 Lindros' official rookie cards are part of the 1990-91 Score Hockey set, which has American and Canadian versions. 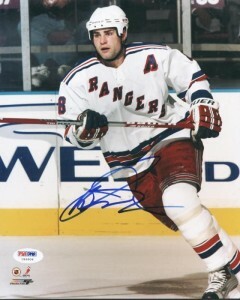 Eric Lindros eventually became injury prone due to his physical style of play and suffered through many partial seasons during the latter stages of his career. Many people feel that despite being a Hart Trophy winner, he never really lived up to his full potential. A very public feud with Flyers management made him a bit of a pariah in later years, possibly causing Lindros to shy away from the public spotlight. His eventual return to hockey's good graces and fence mending with Flyers general manager, Bobby Clarke, has meant increased accessibility for collectors with regards to autographed memorabilia. His tumultuous career limited the amount of autographed memorabilia in the market for sometime and supply seems to just now be catching up with demand. 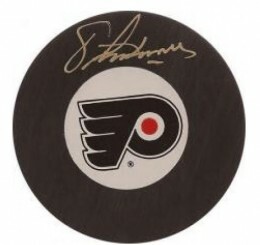 This means stable prices for his most popular items which include signed pucks and Flyers jerseys. Many great first-year players are part of the 1990-91 Score Hockey set. Few, if any, are bigger than Lindros. The card, fittingly, showcases an in-action photo of Lindros retrieving the puck from along the boards, a place he frequently found himself during his career. Lindros signed an exclusive deal with Score before he was drafted. He became a cornerstone for the brand and this card was extremely popular when it was first released. It isn't worth nearly as much as it once was, largely due to its massive availability. While it is nearly identical to the American version, there are two differences. First is the color of the Score logo on the front. The Canadian version is red while the American version is blue. Secondly, the text on the back of the Canadian card is printed in English and French. 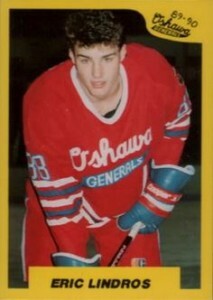 This is Eric Lindros' first appearance on a trading card as a member of the Oshawa Generals. It is very prone to being counterfeited. To protect yourself, it is recommended that collectors only purchase copies that have been authenticated by PSA or BGS. With a stated printed run of 3,088 copies, this card is in no way rare or limited by today's standards. 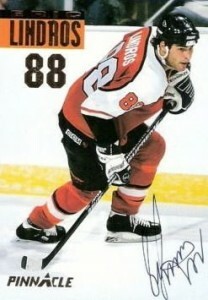 Even still, it is perhaps Lindros' most difficult autograph card to locate on the secondary market. The fact that this was his first officially licensed autograph is part of the reason why. Other reasons include the fact that it was issued via redemption and the actual print run has long been in doubt. The timing of Eric Lindros' first memorabilia card coincided with the advent of game-used materials being used in sports cards as a new innovation in the latter part of the 1990s. Highly coveted by collectors, this card commands a couple of hundred dollars on the rare occasion they make their way to the secondary market. (2) ERIC LINDROS 2017-18 LEAF PEARL PEARLESCENT PATCH LOT RED 5 5 PURPLE 3 3 !! 2017-18 LEAF PEARL HOCKEY ERIC LINDROS PEARLESCENT PATCH # 4 OF 4!! ERIC LINDROS SIGNED 11-12 UPPER DECK ARTIFACTS FLYERS CARD AUTOGRAPH AUTO!! Below you will find an example of what Eric Lindros's authentic signature looks like. This can be used as a first point of reference for determining the legitimacy of autograph memorabilia, but is not a substitute for having your items authenticated by a well-respected professional autograph authentication company. Some of the trusted sources within the sports memorabilia market include the following companies: PSA, JSA, and Steiner. Click on any of the images below to view full-size photos. The signature is complex and not always decipherable although he usually makes the same attempt, the pen being used often influences his signature. 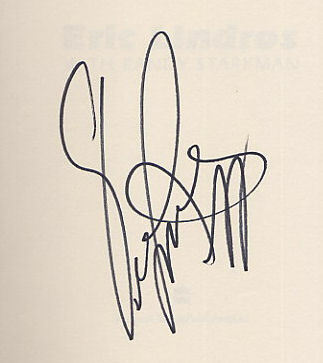 The signature is defined by the over-sized letter "E" that resembles a number "8." The other most legible letter is the very flamboyant and over-sized "L" which includes a much, much smaller bottom loop than the top. The complex nature of his autograph, coupled with his popularity makes his signature prone to being forged. 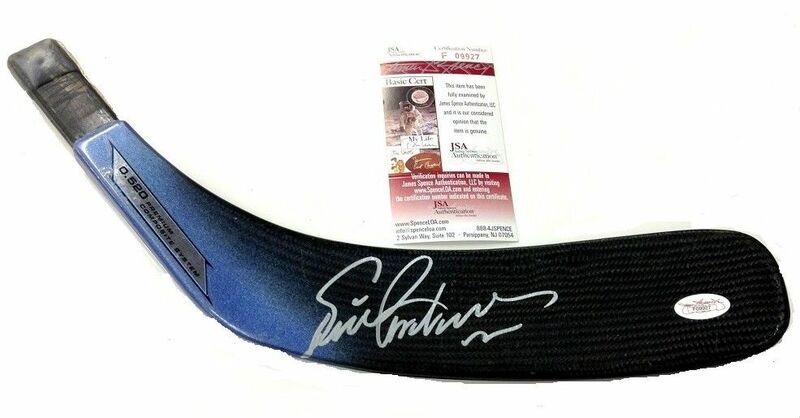 Exercise caution when looking to purchase authentic Eric Lindros autograph memorabilia.